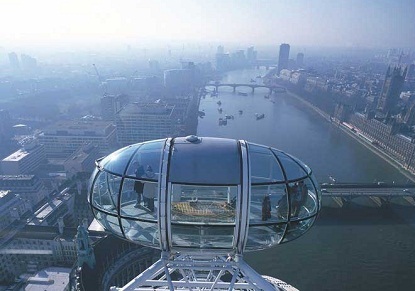 The London Eye Book Online & Save! The Coca Cola London Eye stands 135m high on the South Bank between Waterloo and Westminster Bridges. The experience will take about 30 minutes and offers spectacular views of some of the capital's most famous landmarks, including Big Ben and the Houses of Parliament, Buckingham Palace, Nelson's Column and St. Paul's Cathedral. Visit FIVE of London's top attractions for the price of TWO. 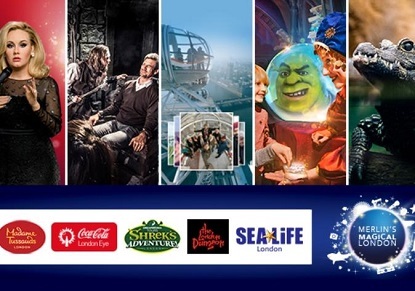 Merlin's Magical London: Madame Tussauds, The London Eye, Shrek's Adventure, London Dungeon and SEA LIFE London aquarium. 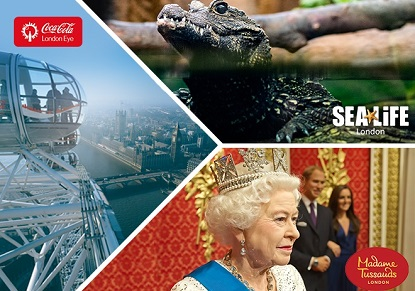 Visit THREE of London's top attractions: Madame Tussauds, Coca Cola London Eye and the SEA LIFE London aquarium. Sweep London's skyline from the London Eye, the world's tallest cantilevered observation wheel. The London Eye is the UK's most popular paid for visitor attraction.